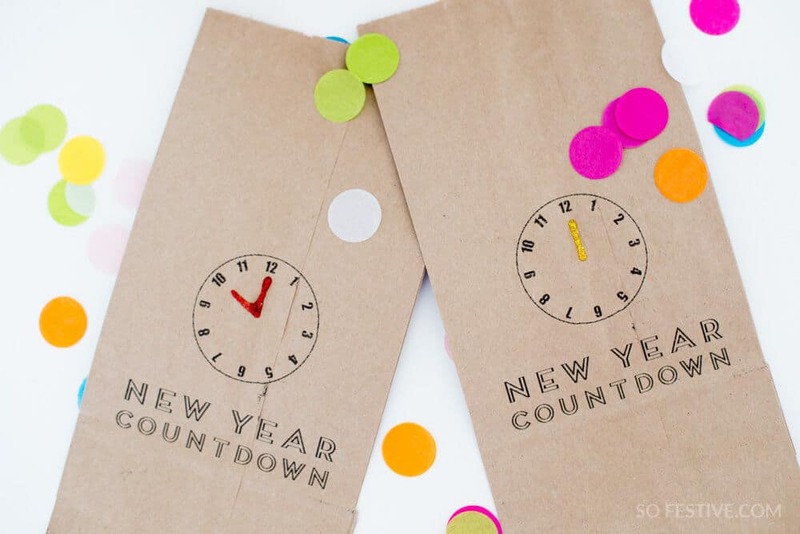 Free New Year's Eve Countdown Bag Printables! - So Festive! 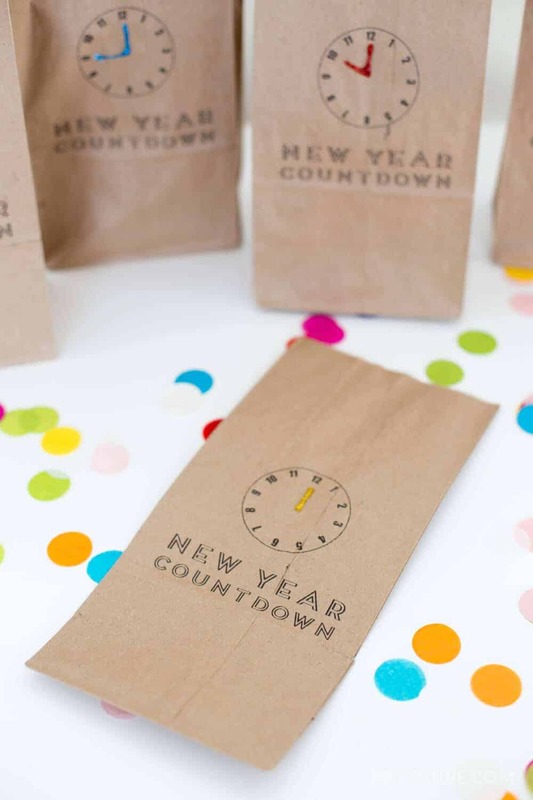 Make the countdown to New Year’s super fun and simple with these cute printable New Year’s Eve Countdown Bags! 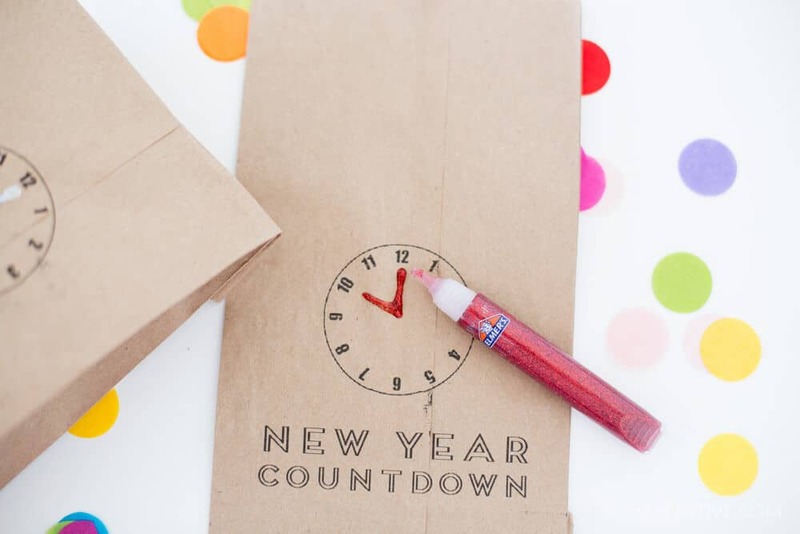 New Year’s Countdown Bags– Fun For the Whole Family!! New Year’s Eve has always been a family affair for us. We let our children stay up as late as they want. Really, it’s a night we can spend time as a family, play games, eat yummy food, and celebrate the New Year together. 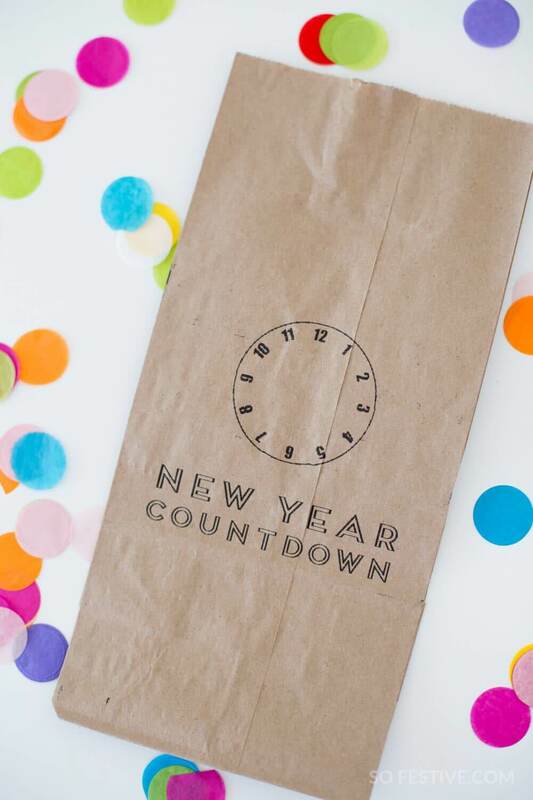 I shared 10 Simple New Year’s Eve traditions right here, but if you’re looking for a fun way to make the countdown to midnight a little more fun, make some New Year’s Countdown Bags. 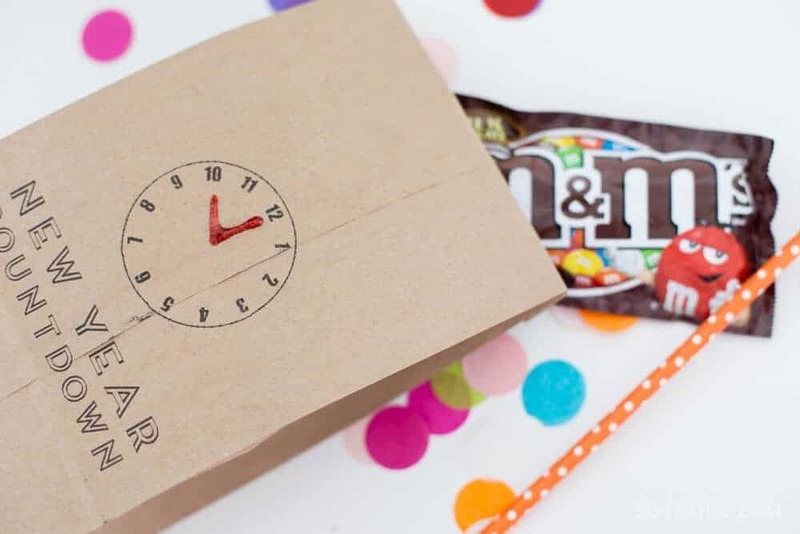 Using a paper lunch sack, you can make a bag for each hour until midnight. You can fill the bag with a small treat or game or activity to play when it gets to that hour. We’ve done this for a few years with our children and they love it! It’s a fun way to stop and focus on the kids for a bit and then get back to the adult socializing. Your paper bags are printed blank, so you can add in any time you want. 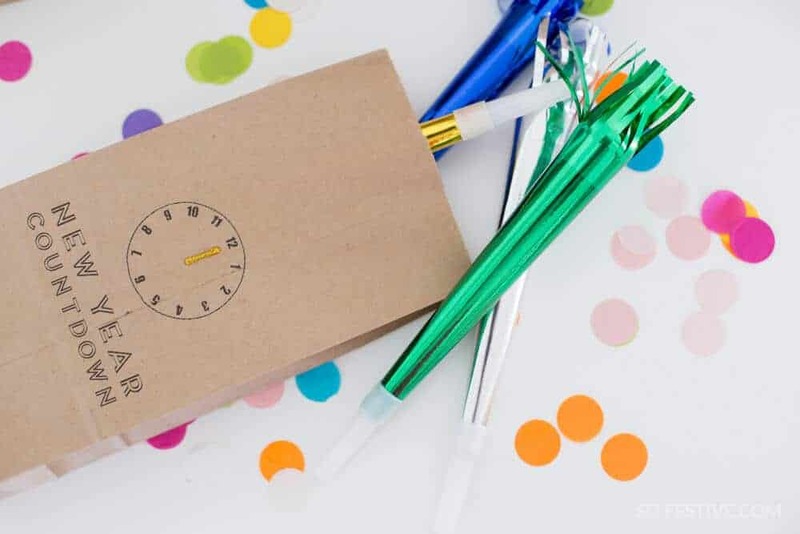 In your midnight bag, add some fun noise makers to celebrate the New Year! small treats, activities, games, etc to fill your bags– see below for some fun game ideas! 1. Download the Countdown Bag PDF. You can find the download in the Freebies section here. 2. Load paper lunch bags (10.125 x 5.125) into your printer. Change your printer settings if needed. 3. Print one bag at a time. My printer didn’t like when I stacked up the paper bags, so I printed one at a time. Also, you may want to change your printer setting to draft so that you don’t get a lot of extra ink on your bags like I did at first. 4. Let the bags dry for a few minutes. Then using glitter glue or a marker, label what time that bag can be opened! 5. 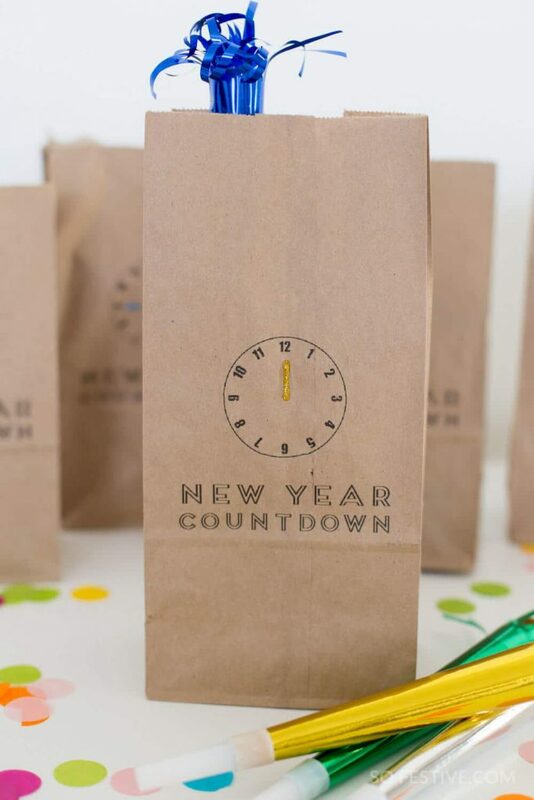 Fill the bag with a fun treat, card game, or activity to do at that hour as you countdown to the New Year. Place a bag of M&Ms or Skittles in a bowl. Have everyone sit in a circle. Give everyone a straw. Start a timer for 15 seconds (or feel free to adjust the time!) The first person uses their straw to pick up as many candies as they can in that time. Once they have sucked up a candy, they place it in a pile next to them. (You can give everyone a paper plate or bowl for this.) When the time is up, the bowl of candy goes to the next person. Repeat until everyone has had a few turns, or until the candy runs out. The player with the most pieces of candy at the end wins. Have everyone attach a dollar bill to their shirt, using a safety pin or clothespin. Designate a word that if “off limits” for the duration of your New Year’s party, or for a set amount of time. You could use words such as “party, food, water, game, etc.” If someone hears that word said, the player that hears it gets the dollar bill. They then attach it to their shirt. At the end of the time, each player gets to keep the money they have attached to them.